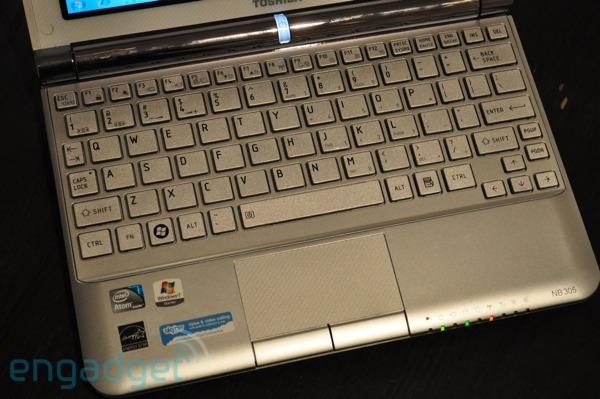 If there's been a Renaissance man in the world of first-gen netbooks it'd be the Toshiba Mini NB205. Its long battery life, comfortable keyboard and attractive and sturdy build distinguished it from the others, even when it made a late entrance to the little laptop market last year. Like most manufacturers, Tosh has gone and refreshed its knockout netbook with Intel's Atom Pine Trail platform and slightly altered the design. But has the competition caught up to the $399 Mini NB305? Or does the Mini NB305 still hold a place in our hearts as the most versatile netbook out there? Find out after the break in our full review. Straight up, we love the design of the Mini NB305. 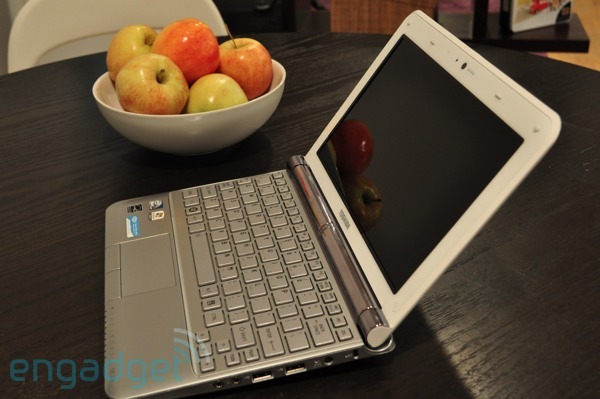 Compared to the Acer Aspire One 532h and the ASUS Eee PC 1005PE it feels tougher and it's just better looking. Sure, it may not be as dapper as the Nokia Booklet 3G, but its matte plastic lid adorned with diagonal raised lines and its silver-ish rounded hinge gives it some standout appeal. And yes, it feels good not to complain about a glossy fingerprint attracting cover. We also like the centered-on-the-hinge power button that glows when the machine is turned on. The six-cell battery has been remolded so it doesn't horizontally bulge out of the back, like it did on the Mini NB205, and it now only protrudes slightly from the bottom. The entire 1.4-inch thick chassis isn't as thin as the inch thin Aspire One 532h, but at 2.6 pounds it's still fairly light. 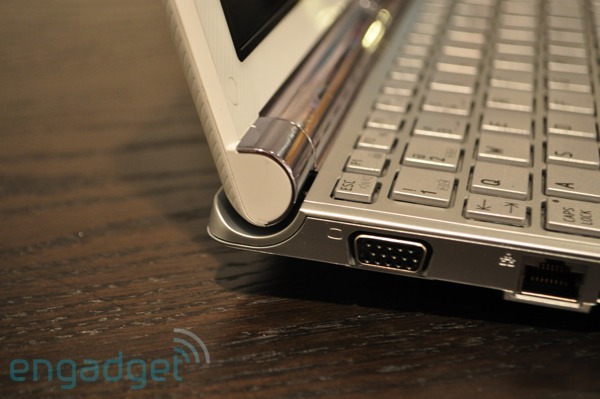 Around the netbook are the standard ports: three USBs, VGA, Ethernet, an SD card reader, and mic and headphone jacks. Many have been asking about the lack of HDMI ports on these new netbooks, and while we'd welcome the additional port for easily hooking up to a larger monitor or HDTV, it's obvious Atom alone can't handle even 720p videos, and thus it's been left off the list. Under the lid, the NB305 still has one of the best netbook keyboards out there. The chiclet layout works extremely well, and the silver keys are coated in something that makes them feel soft on our fingertips -- there's a $350 version of the NB305 that has a flush matte keyboard. Our one complaint lies with the volume controls, which are located on the number keys; no on-screen rocker appears when you adjust them. Speaking of sound, the speakers on the NB305 seem louder than that on the NB205, but they're still weak compared to the 532h's. We appreciate that the touchpad is larger than most, and features dedicated right and left mouse buttons instead of a cramped rocker, but the multitouch pad is too sensitive and we were constantly zooming in on pages. We've become quite speedy at switching off this function in the Synaptics menu -- a skill that we're rather proud of. The 10-inch, 1024 x 600 resolution screen is bright with just the right amount of gloss, and actually looks better than most when it comes to viewing angles. We didn't have to make any real adjustments to share the screen with a friend. The display may be the best we'll ever get on a netbook. Too bad it's surrounded by a thick bezel -- although its pattern does nicely match the lid. The NB305 has a 1.66GHz Intel Atom N450, 1GB of RAM, and an accelerometer-protected 250GB hard drive that boots Windows 7 Starter -- all of which makes the performance quite standard for a netbook. Writing this review in Microsoft Word 2007 while chatting in Pidgin and surfing the web in Firefox was rather peppy. No changes either with the GMA 3150 graphics GPU: it's fine for playing back standard-def videos and streaming YouTube and Hulu videos, but anything high-def makes it uncomfortable and it starts stuttering. The Mini NB305's 5300mAh, 61Wh six-cell battery lasted 6 hours and 30 minutes on a video rundown test with brightness set to 65 percent, and about eight hours during our typical routine of web surfing, chatting and writing. Now, don't get us wrong: six hours of movie playback is really good, but it isn't close to Toshiba's predicted 11 hours of juice or as good as the Eee PC 1005PE's eight hours on our video test. Tosh has loaded up the Mini NB305 with its proprietary software as well as the typical free trial of Norton, and a few of the programs are actually quite useful. ReelTime seems a bit of a slap in the face to Windows 7's multitasking functionality, and places a toolbar along the bottom of the screen with shortcuts to commonly used programs, open applications and files. Bulletin Board lets you post notes or pictures on a digital board, although it's probably more useful on a touch-enabled screen. The only really peeving app is the Webcam Assistant, which is set to permanently hide on the side of the screen. We're not self-haters or anything, but we found no use for taking our picture several times a day and disabled it immediately. We know, we know. The Mini NB305 doesn't perform better or last longer than the other Pine Trail netbooks out there, but there's just something about it that we like better than the rest. Sure at $399 it's more expensive than the longer-lasting $380 Eee PC 1005PE, and even $100 more than the entry level Aspire One 532h, but it's more comfortable to use than them both. 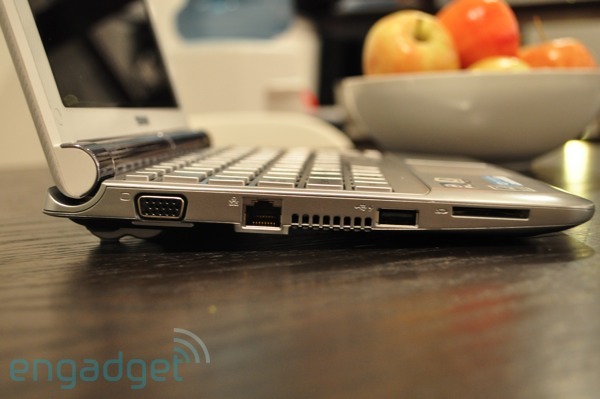 And when it comes to netbooks, that may just be enough to shell out the extra cash.